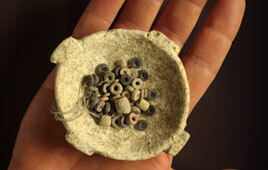 Extensive archaeological excavations carried out by the Israel Antiquities Authority prior to the widening of Highway 79 in northern Israel led to the uncovering of a treasure of impressive prehistoric finds. A treasure of impressive prehistoric finds was exposed during the course of archaeological excavations the Israel Antiquities Authority conducted this past year,on behalf of the National Roads Company, prior to the widening of Highway 79 in northern Israel. The excavations encompass a large area covering a distance of c. 800 m, on both sides of the road. Prehistoric settlement remains that range in date from the Pre-Pottery Neolithic period (c. 10,000 years ago) to the Early Bronze Age (c. 5,000 years ago) are at the Ein Zippori site, which extends south of Ein Zippori spring. According to Dr. Ianir Milevski and Nimrod Getzov, excavation directors on behalf of the Israel Antiquities Authority, "The excavation revealed remains of an extensive settlement from the end of the Neolithic period and beginning of the Chalcolithic period in the country belonging to the "Wadi Rabah" culture. This culture is named after the site where it was first discovered (in the region of Rosh Ha-Ayin), and is common in Israel from the end of the sixth millennium and beginning of the fifth millennium BCE." According to the excavators, "The presence of remains from the Wadi Rabah culture in most of our excavation areas and in surveys that were performed elsewhere at the site shows that Ein Zippori is an enormous site that stretched across c. 200 dunams. It turns out that this antiquities site is one of the largest, if not the largest, in the country where there are remains of this culture. The architecture is rectangular and the floors were made of crushed chalk or very small stones. The foundations were made of stone and the walls above them were built of mud bricks." A multitude of artifacts has been uncovered in the excavation, includingpottery, flint tools, basalt vessels and artistic objects of great importance. Milevski and Getzov said, "Pottery bearing features characteristic of the Wadi Rabah culture such as painted and incised decorations and red and black painted vessels were exposed." "Outstanding among the flint tools that were discovered are the sickle bladesthat were used to harvest grain, indicating the existence of an agricultural economy. We also found flint axes that were designed for working wood. The barter that transpired at the time is attested to by thin sharp blades made of obsidian, a volcanic stone that is not indigenous to the region and the closest source is in Turkey. These items constituted part of the network of trade that stretched over thousands of kilometers in such an ancient period." Among the special finds that were uncovered in the excavation is a group of small stone bowls that were made with amazing delicacy. One of them was discovered containing more than 200 black, white and red stone beads. Other important artifacts are clay figurines of animals (sheep, pig and cattle) that illustrate the importance of animal breeding in those cultures. The most importance finds are stone seals or amulets bearing geometric motifs and stone plaques and bone objects decorated with incising. 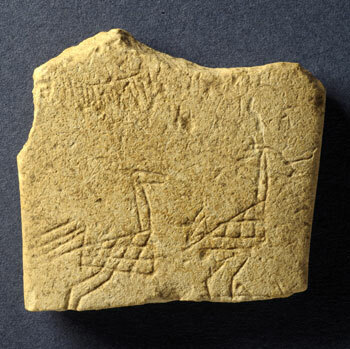 Among the stone plaques is one that bears a simple but very elegant carving depicting two running ostriches. These objects represent the world of religious beliefs and serve as a link that connects Ein Zippori with the cultures of these periods in Syria and Mesopotamia. According to Milevski and Getzov, "The arrival of these objects at the Ein Zippori site shows that a social stratum had already developed at that time that included a group of social elite which used luxury items that were imported from far away countries."